It took me 5 years to convince my skeptic husband to purchase a Dyson vacuum. After 3 cheap crappy & very broken vacuums later he finally agreed. I. Am. In. LOVE! It has 10 times the suction and 1/3 of the noise. Now I can vacuum without scaring the life out of my little ones. Even Josslyn will sleep through me vacuuming right next to her. We opted for the DC14. Since we only have a cat who doesn't shed much we thought this was the best one for our family. It is super simple to put together. Just snaps together in minutes. I couldn't believe the amount of dirt and dust that I vacuumed in 1 use. Especially since I thought my carpets were pretty clean. Minus the kid stains, LOL. Cleaning out the canister couldn't be easier. 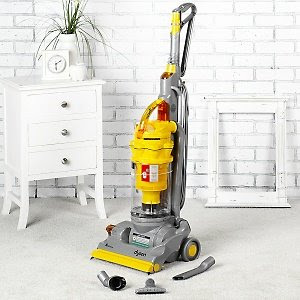 In my old canister vacuums I always spilled dirt back onto my floor, my hands were always covered in dust and dirt as well. With the Dyson it's as simple as pressing the release button and it empties out from the bottom straight into the trash can. No mess!!! I mean really, who wants to vacuum up mess, only to put it back on the floor to vacuum up again?!?! My advice...buy a Dyson. Get it right the first time. I know you are all thinking, "Dyson's are way too expensive!" If you think about it. I purchased 3 reasonably priced, cheap, vacuums all ranging around $150 dollars, in a matter of 4 years and all 3 broke. Simple math can tell you, that is not cheap. Dyson gives you a 5 year warranty on their vacuums. You just can't beat that! So...GO BUY A DYSON! You will not regret it. I love mine, too! Love, love, love! Bobbys parents let us borrow theirs when we moved to watersedge and I did not want to give it back! I hope one day I can convince him to buy one especially considering my hair sheds like a dogs...lol. Miss you guys!